Cassandra's stories about second grade are so exciting that her mother wishes she could be a student again. This wonderful classroom has singing, playacting, math--even a rabbit named Lopsy. But nobody's mother is in second grade! What's Cassandra's mom--who has even saved her old lunch box--to do? It is Cassandra who thinks up the perfect disguise for her mother, and she sets off for school one morning with a beautiful... plant. What do plants and mothers have in common? More than you'd think, as this wacky and endearing tale shows! "Pulver's ebullient tale fetchingly portrays the love and genuine friendship between a daughter and a mother who aren't afraid to act silly together." There's something peculiar about this story: it's ridiculous! When I was writing it, I spoke with second grade teachers to find out what facts their students learn about green plants. Then I used those facts, playfully, in the story. Question for readers: sometimes the things that make us laugh are the things we remember best. 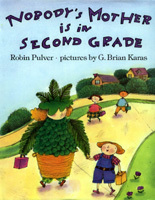 Can you find something funny in this story that helps you remember a fact about green plants?